Bonnaroo began as a way to reinvigorate outdoor music festivals, its organizers said Wednesday, Oct. 8, at MTSU, and over the last 13 years has used its business model to embrace and expand on the same peaceful, inclusive culture of the events that inspired it. 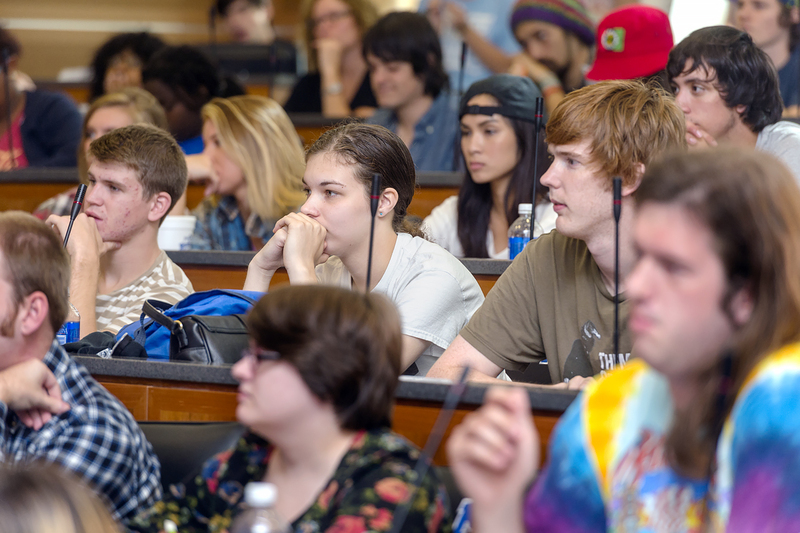 The daylong seminar sponsored by MTSU’s College of Mass Communication, “Bonnaroo: The Making of a Music Festival,” drew standing-room-only crowds in a parliamentary room normally used by the Student Government Association. Staffers from every facet of the event joined Bonnaroo co-founders Ashley Capps, Jonathan Mayers and Rick Farman to explain how they create, promote, maintain and safely operate a city of 80,000-plus people that emerges for four days every year near Manchester, Tennessee. Facing the crowd are, from left, panel moderator Pat Embry, director of MTSU’s John Seigenthaler Chair of Excellence in First Amendment Studies; Bonnaroo co-founders Ashley Capps, Rick Farman and Jonathan Mayers; Charlie Jennings, Bonnaroo director of operations; Bryan Benson, vice president for Bonnaroo co-producer AC Entertainment; and Russ Bennett, Bonnaroo’s head of visual design. After explaining to the MTSU audience how planning each Bonnaroo is now a year-round effort and fitting the artists for each year’s event into the site’s multiple venues is “like a big puzzle,” co-founder Mayers noted that we “started with a business plan, and … a lot of adjustments have had to be made. That figure for ticketholders doesn’t include the full event staff that ranges from 8,000 to 10,000 workers when Bonnaroo is at full steam. The daylong seminar discussed all aspects of the internationally acclaimed festival from its business model, planning, marketing and media to its community spirit, volunteerism, music and programming. Its revenue streams have expanded from the traditional concert ticket sales, concessions and merchandise to encompass VIP event packages, corporate sponsorships, live streaming audio and video and licensing of audio and video content. “It’s an extraordinary opportunity for a college of media and music to host a group of professionals so adept at both,” said Mass Comm Dean Ken Paulson, who introduced several of the day’s panels. Mass Comm teamed up with Bonnaroo leaders earlier this year in an ongoing partnership that brought the festival officials to campus in April for question-and-answer sessions with students and then put MTSU students behind the scenes at Bonnaroo in June for multimedia news coverage. The Oct. 8 public symposium also is part of that partnership, Paulson said. 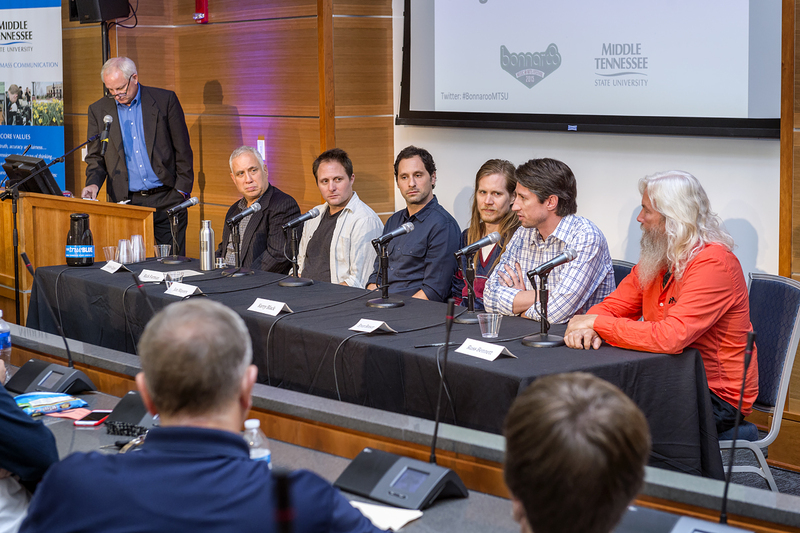 The event was streamed to classrooms on campus and was recorded to create a “video textbook” and possibly a video course for MTSU’s music business curriculum. As for what’s next for Bonnaroo, organizers were circumspect about the future. To watch a clip of the symposium, please click here. Thank you to MTSU News & Media Relations. Photos by J. Intintoli.